The 34th Street Partnership says food carts with flashing signs, like this one, are too ugly for Midtown's streets. MIDTOWN — A campaign to clear Midtown of its iconic food carts and street vendors has been launched by the neighborhood's business owners. The food and general merchandise sellers who set up carts, stalls and tables to hawk their wares are eyesores that are cluttering streets, littering and generally being obnoxious, said members of the 34th Street Partnership. 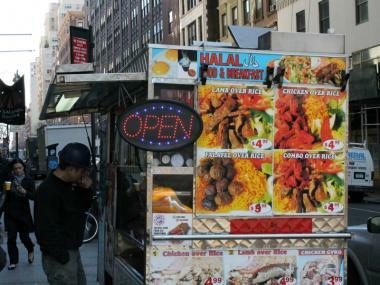 "The problem is really simple: the food vendors, with about five exceptions, are the ugliest collection of miserable-looking vehicles we've ever seen," said Dan Biederman, who heads up both the Partnership and the Bryant Park Corporation. "The vendors are almost exclusively terrible citizens, they litter with impunity and are generally rude to anyone who asks them to clean up." The campaign is still in its early stages, but the partnership has reached out to city officials, asking them to reduce the amount of street vendors in Midtown by taking away licenses and making sure that they're in better locations. Biederman said the problem has gotten particularly bad since many vendors started putting flashing signs on their carts. Food vendors often create excess smoke and odd smells, the organization said, and they leave their trash piled up on street corners. The group also wants the remaining vendors to beautify their carts, using the few carts it finds attractive — including popular vendor Wafels and Dinges and the Fruit-n-Juice cart that's typically around West 35th Street and Broadway — as a template. The group has also made presentations in front of Community Board 5, asking for its input and arguing that a crackdown would make streets in Midtown more pleasant for residents, tourists and office workers alike. But vendors and their advocates are skeptical of the group's intentions. "They can't handle what real New York is like," said a sock vendor who identified himself as Raul. "They want it to be happy, shiny, bright, but we've got to make a living too." Raul and other vendors said they had not heard specifics about the 34th Street Partnership campaign, but that they doubted the efforts would have any teeth. "It's a little bit crazy to call vendors ugly and take them away from the neighborhood," said Matthew Shapiro, an attorney with the Street Vendor Project which advocates for the merchants. "They can't afford to invest in their businesses and make them look better because they're always getting slammed with fines." Shapiro argued that the vendors provide important jobs to immigrant populations, and help bring moderately-priced food and merchandise to people who can't afford Midtown's more expensive offerings. "When people think of New York, they think of street vendors," Shapiro said. "They think of the hot dog cart. It's part of the city." The vendors are regulated by a variety of city organizations, including the Department of Consumer Affairs and the Department of Health and Mental Hygiene. "There's not much of an impetus to change regulations right now," Biederman said. "Something else can be done. "This is the biggest complaint we get now that we've cleaned up litter, crime, and graffiti — and the city played a role in all of those."